Security lock with manual deadlocking by reverse turn of the key in the outside cylinder. Key operation from outside and lever handle on the inside. Supplied with cylinder and two keys. 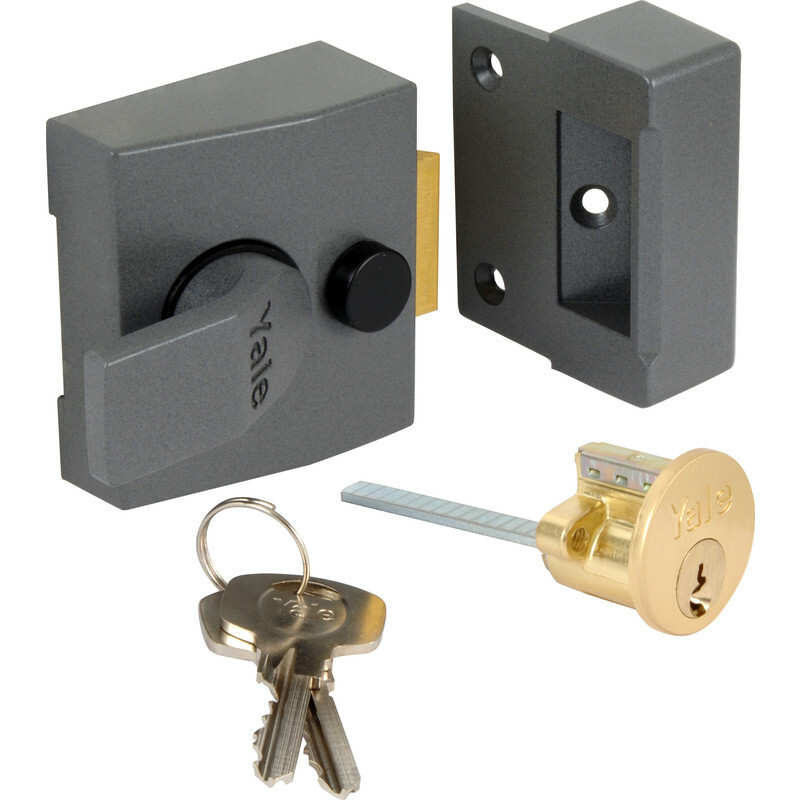 Yale DMG Deadlocking Nightlatch 85 Narrow is rated 4.4 out of 5 by 9. Rated 5 out of 5 by Peejay50 from Works very well and with the money I used this to do a lock change and it was relatively easy to change over. Rated 5 out of 5 by nevvski from Very Strong & Secure I bought this lock to replace my old Yale when the internal return spring for the latch failed. The back plate dimensions were the same as the old so a straight forward replacement. A very good quality product. It is worth shopping around on the price as toolstation were the cheapest I found as I needed it the same day. Some of there direct competition are much more expensive even though they are all owned by the same parent company. Rated 5 out of 5 by murfam from Good Service I purchased a Yale nightlatch on line only to discover that it was the shortened version that would replace my old lock. After phoning I took it back to my nearest branch who swapped it for me after checking it against my template. Rated 5 out of 5 by Klee from Fantastic item Bought this a few weeks ago but my builder came round finally and fitted it. It's solid item. I'm a happy customer. Rated 2 out of 5 by Dazzer1410 from Looks nice I did not like the barrel securing plate,thought it was cheap. Once all fitted the dead lock would sometimes jam. Rated 3 out of 5 by East Midlands from Beware if you use this on an outward facing door It is all very well to explain that the bolt has to be inverted and put a video on youtube showing this but the keep does not fit my door so I have had to order a reverse keep.